Our payroll system offers many features that can cater to the special payroll processing needs of a Bakery. Processing payroll with Payroll Mate® is a piece of cake. The program provides you with many helpful features including built in tutorials that are always accessible. For $119 only, process payroll for up to 75 bakery employees for one calendar year. If your dream has always been to operate your own bakery, there can certainly be many rewards associated with doing so. You will likely find that operating a bakery may come with some responsibilities for which you need to be prepared for. Among those responsibilities is payroll preparation. From behind-the-counter-staff, to bakers, to janitorial staff, you must ensure that your employees are paid on time. Rather than manually preparing payroll, you can instead rely on Payroll Mate®. Payroll Mate® is designed to make processing payroll for your bakery easier and faster. • Payroll Mate® supports up to 10 companies with 75 employees each company. • Accurately calculates State and Federal Withholdings, Social Security, Medicare, and net pay. • Conveniently prints signature ready checks as well as pay stubs that can also be easily emailed to employees. • Payroll Mate® is designed to help you launch your payroll with ease. • The step-by-step setup wizard and tutorials will walk you through every step of the process. • If you should find that you ever need assistance, friendly customer support is conveniently available via chat, email or phone. • With this robust software, you can handle a variety of pay frequencies such as daily, weekly, bi-weekly, semi-monthly, and monthly. • Payroll Mate® supports a variety of pay types such as hourly, salary, commission, bonuses, and many more. • The report options provided by Payroll Mate® can give you the payroll information you need. Such reports include: Employee Lists, Employee Earnings, Taxes & Deductions, Deposit Requirement and many more. These reports can easily be viewed and printed or exported to Excel for additional insight. • Payroll Mate® is easy to customize by giving you the ability to custom create unlimited user defined income, tax, and deduction categories. This allows you to process payroll for any type of employee. • These features ensure that processing payroll is a piece of cake. 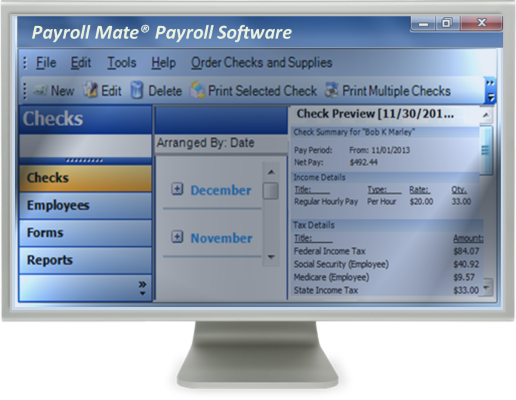 • Payroll Mate® is designed to work with Windows operating systems. • Have a Mac that you use in your bakery? No problem. As a Mac user, you can still use Payroll Mate® simply by using a virtualization technology, such as Parallels Desktop. • Payroll Mate® offers the opportunity to export payroll data to accounting software applications such as Quicken, Peachtree Sage50, and Intuit QuickBooks. • Since this software is not an online payroll solution, you will still be able to gain access to important payroll data regardless of internet connectivity. • Payroll Mate® offers easy backup and restore features to ensure you will never lose important payroll data. Administering payroll for a Bakery firm can deliver its own unique set of challenges, but with the right payroll program, you can ensure that your payroll is administered easily and efficiently. • You can also send out 1099s to vendors if you hire independent contractors for your bakery. This is an additional cost add-one feature to Payroll Mate®. This feature can also be used to create non payroll checks for things such as rent payments, utility bills, etc. • If you grant the employees of your bakery sick leave and vacation time, Payroll Mate® will give you the ability to easily track the amount of time that your employees have earned and when that time is spent. Administering payroll can be complex for bakeries of any size, but with Payroll Mate®, you can be assured that everything is under control.